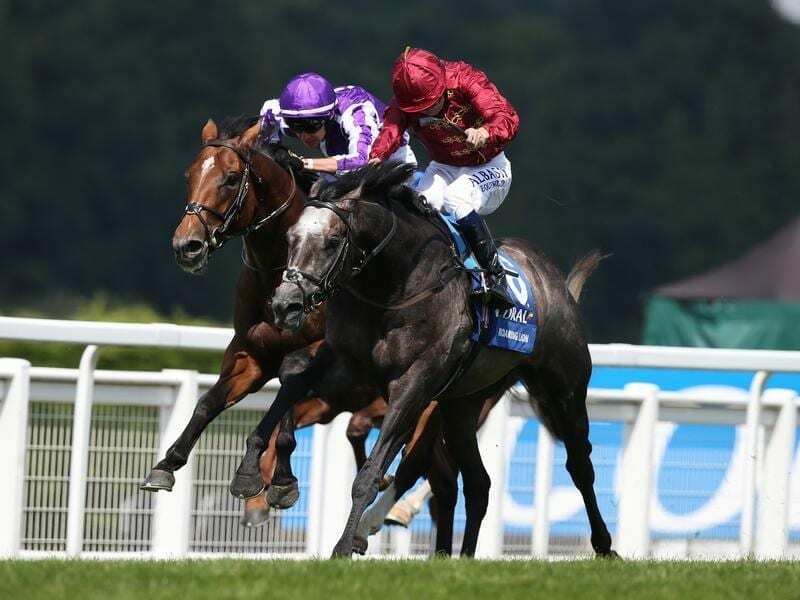 Roaring Lion (r) will run in the QEII Stakes over 1600m rather than the Champion Stakes at Ascot. Roaring Lion will run in the Queen Elizabeth II Stakes at Ascot rather than contest the Champion Stakes with track conditions on the different courses the deciding factor. The John Gosden-trained colt, who has won three Group One races over a mile-and-a-quarter (2000m) at his past three outings, is owned by Sheikh Fahad al Thani’s Qatar Racing Ltd, a subsidiary of Qipco who sponsor Champions Day. Roaring Lion has not run over a mile since finishing fifth in the 2000 Guineas in May before he went on to win the Dante Stakes at York. As over 40 millimetres of rain fell at Ascot at the weekend, the ground is predominantly heavy on the round course while the Queen Elizabeth II Stakes takes place on the straight mile, which is currently soft, heavy in places. Roaring Lion has a preference for quicker ground, which has had a bearing on the decision to run in the shorter race on Saturday. “It’s been confirmed that he’ll go for the QEII as unfortunately there’s no sign of the ground drying up to not have heavy in the description on the round course,” Sheikh Fahad’s racing manager David Redvers said. “Obviously it’s disappointing he can’t compete in the Champion Stakes, but all along we’ve known that while we don’t have too much of a fear about him acting on soft ground, he’s got too good an action to have him flying through mud. “Also, he seems to be more about speed this horse, He’s not a grinder – he’s got a serious turn of foot. I don’t think there’s any question now he’s a faster horse than when he ran in the Guineas.